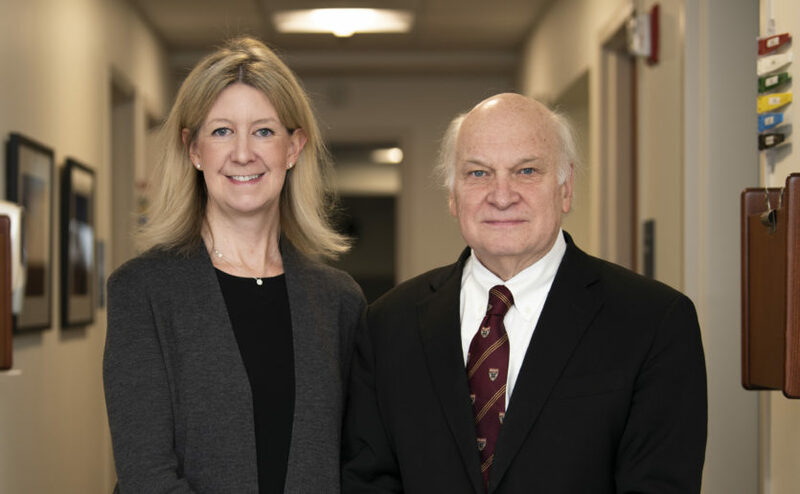 Amy Spooner, MD, and Duke Cameron, MD, co-directors of the newly launched Marfan Syndrome and Related Disorders Clinic. Aortic aneurysms are known as “silent killers” because the tearing or rupture of the aorta often occurs without warning. The newly launched Marfan Syndrome and Related Disorders Clinic at the Corrigan Minehan Heart Center at Massachusetts General Hospital is part of a collaborative effort to gain a better understanding of what strains the aorta and causes these ruptures. “Our comprehensive approach to patients with Marfan syndrome places the Corrigan Minehan Heart Center at the forefront of personalized medical care,” says Duke Cameron, MD, co-director of the Marfan Syndrome Clinic. Marfan syndrome is a genetic disorder than can cause aortic enlargement and aneurysms, as well as other medical challenges affecting different areas of the body, especially the eyes and feet. Individuals with the disorder, including Abraham Lincoln and “Rent” composer Jonathan Larson, often have a tall, thin frame and long arms, legs and fingers. The Marfan Syndrome Clinic is the newest initiative of the multidisciplinary Thoracic Aortic Center, which this year celebrates two decades of outstanding, innovative care. The Thoracic Aortic Center is led by three co-directors: Eric Isselbacher, MD, who specializes in thoracic aortic disease and echocardiography; Matthew Eagleton, MD, one of the most accomplished endovascular aortic surgeons in the country; and Dr. Cameron, a leader in valve-sparing aortic root replacement surgery among patients with Marfan syndrome. This collaborative effort allows for a multipronged approach to understanding how aneurysms form at the genetic level, refining lifesaving surgical procedures and delivering comprehensive care across the lifespan. By treating a large number of patients with Marfan syndrome, clinicians and researchers are gathering the data needed to find answers that can help prevent aneurysms in these individuals. At the same time, they shed light on how to prevent aneurysms among a broader population. Marfan Syndrome Clinic Co-directors Amy Spooner, MD, and Dr. Cameron have assembled a cohesive team of Mass General experts from other specialty areas to address the wide variability of symptoms among patients. Their collaborators include Christopher W. DiGiovanni, MD, chief of the Foot and Ankle Service, John Shin, MD, director of the Metastatic Spine Oncology and Spinal Deformity Surgery and colleagues in Ophthalmology at Massachusetts Eye and Ear Infirmary. This team meets regularly to share expertise and help educate clinicians about effective clinical diagnoses to avoid emergency surgery and anticipate complications before they occur. To learn more about how you can support the Marfan Syndrome and Related Disorders Clinic and the Thoracic Aortic Center, please contact us.